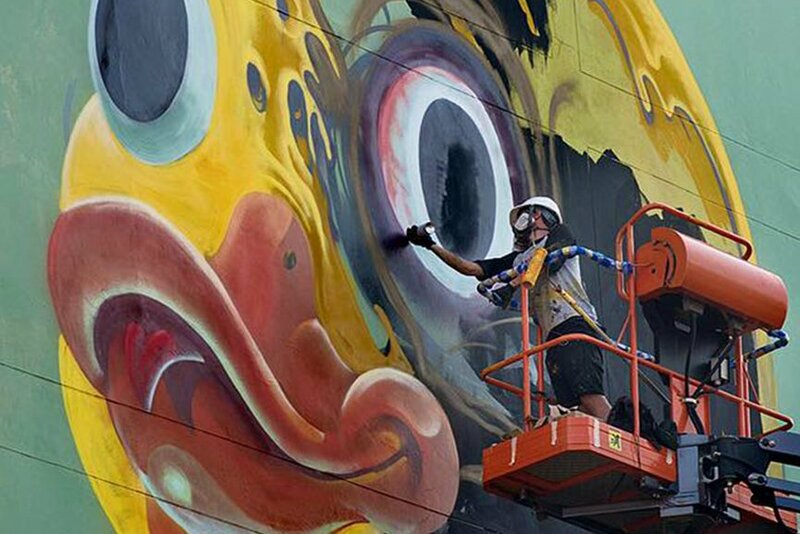 This Street Update coincides with the pertinent street art event in New Delhi, India. 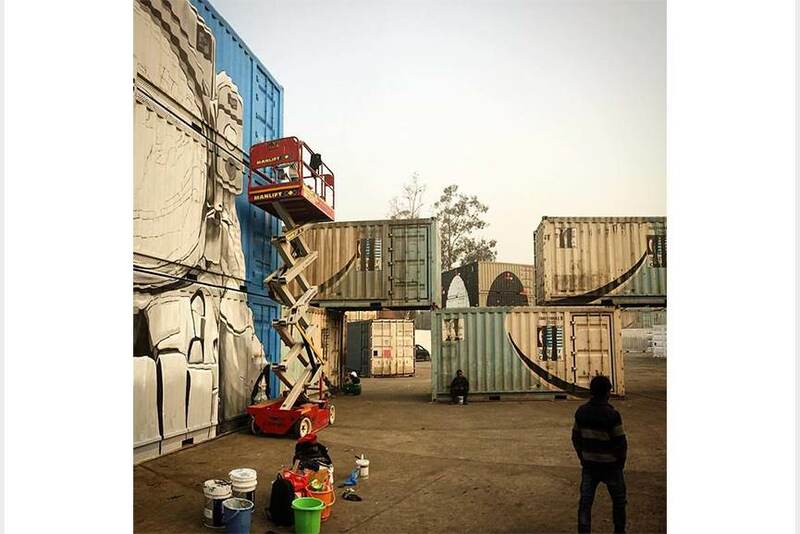 St+art India Foundation, which organizes high-quality urban art festivals across India, provided an interesting festival called WIP. 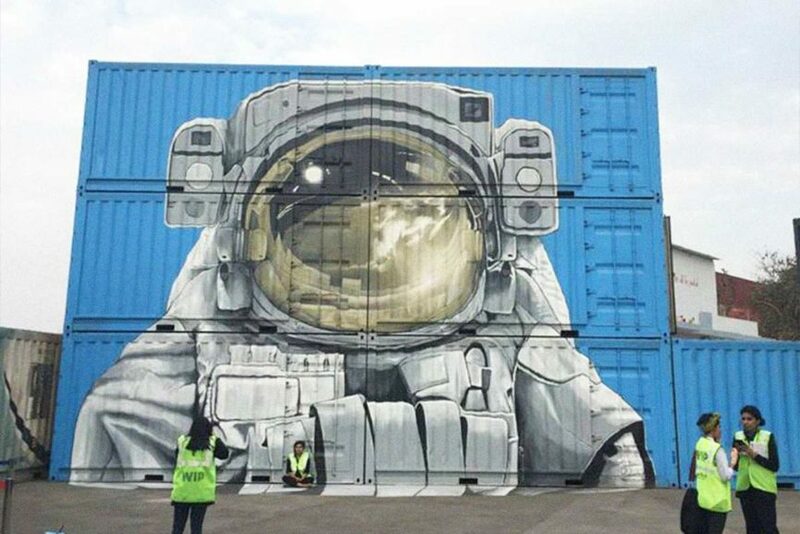 Some of the latest art pieces were made on shipping containers, at Inland Container Depot, Tughlakabad, and there are lots of beautiful murals to be seen, so we strongly suggest that you take a look at the pieces that appeared on these metallic, ribbed surfaces. One of them is presented in this article. 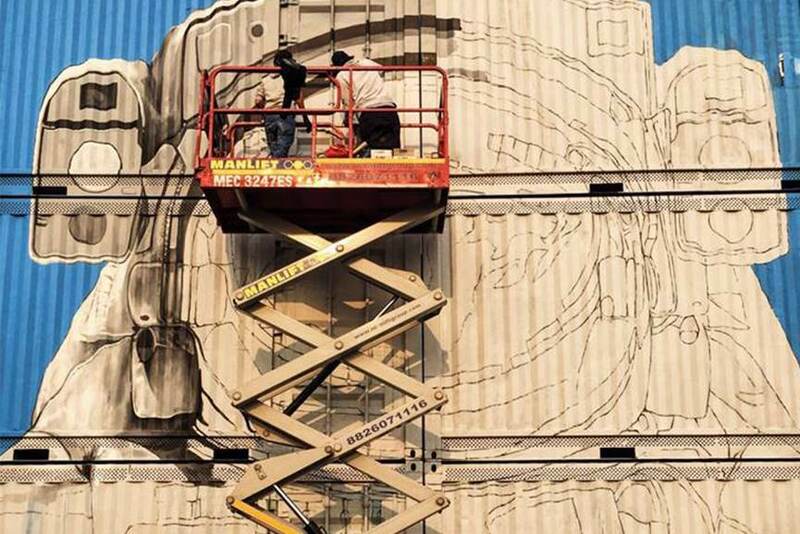 The rest of the murals that we have prepared for you were actually all made somewhere (relatively) close to the Equator, which is probably what makes us, from the colder parts of the Northern Hemisphere, very jealous. The colors and the aura of these depictions, combined with their surroundings, radiate slow summer vibes and laziness. Before you take a look at these beautiful murals, we would like to remind you of a few interesting shows that are coming up very soon. Do not miss the opening of Love is a Dog from Hell group exhibition at Reed Projects Gallery in Norway, on February 4th, or a selection of female urban artists’ works at Saatchi Gallery in London, which opens February 3rd. 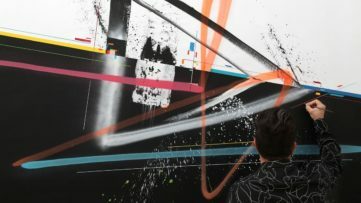 Or, if you happen to be in France on the previously mentioned February 4th, you should definitely see a stencil point of view… at GCA Gallery. 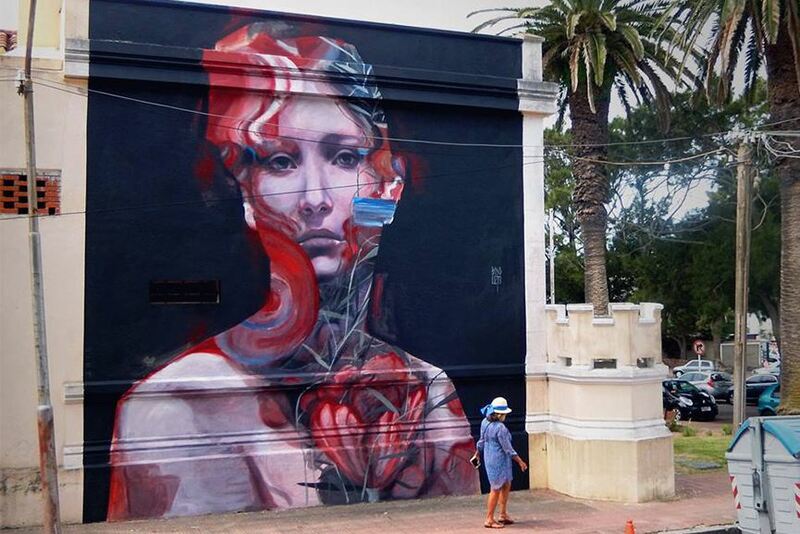 And now, for the best murals made in the past week, scroll down. 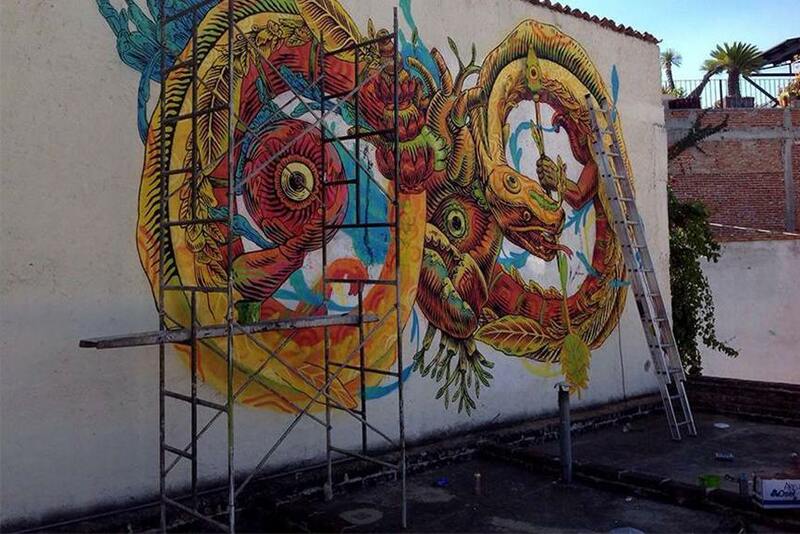 Visit our page on facebook to stay in touch with the latest information on urban and street art. 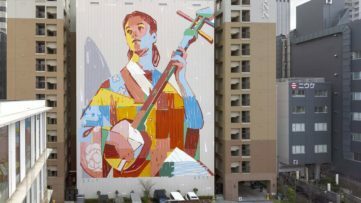 Large-scale is an attribute frequently used to describe murals, but when it comes to the oeuvre of Ella & Pitr, those words have a whole other meaning. The French duo’s genuine style is what keeps them on their level. In their own way, they have reinvented the discipline. 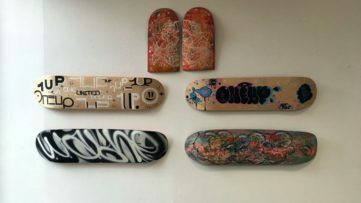 They realized that street art is not only for the walls and railway wagons, and that the horizontal surface works just as well, if not better. Will the world ever get enough of the charming, giant characters that they make? The most interesting part of scanning the photos of their work is detecting the people who are on them. That’s the point when the scale gets real. 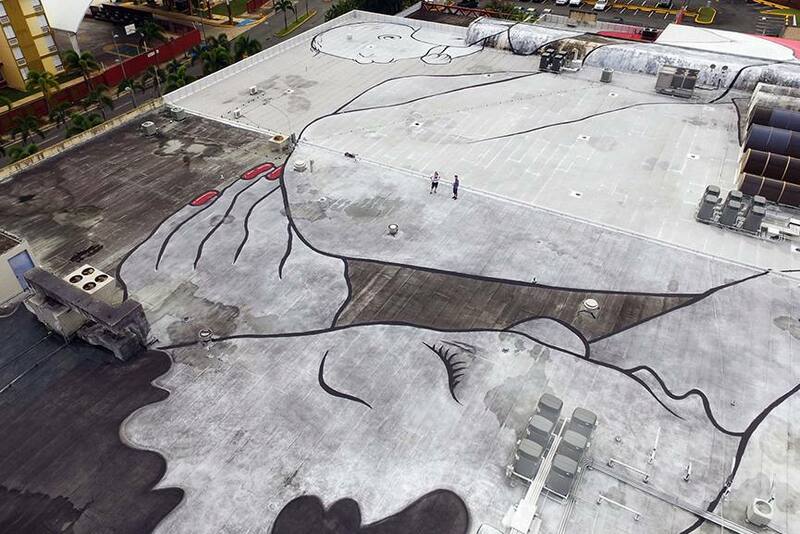 Areuz’s work is a commission for Muros en Blanco urban art festival in Mexico. 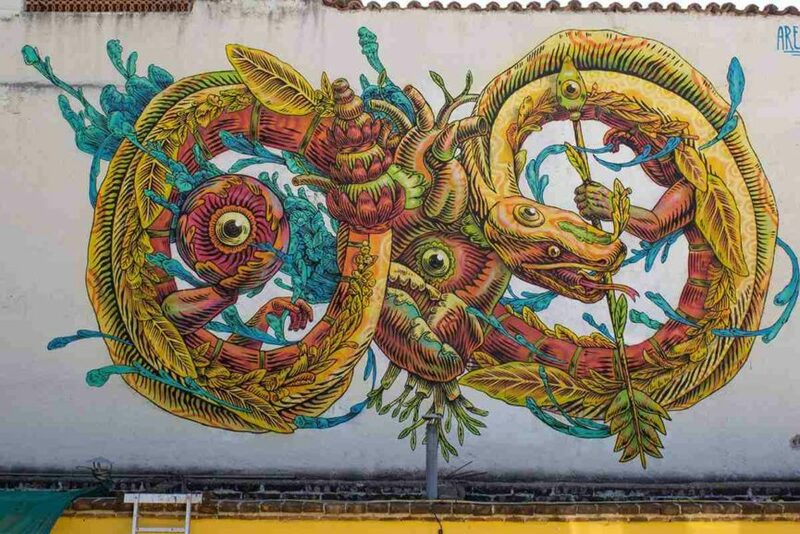 Along with Areuz’s interesting, colorful mural, some other artists made their contributions – Magda Love, GLEO, Jarus + Monke, El Dante, Meik, Himed & Reyben, and BOOMZER + KDKS + MICKER. 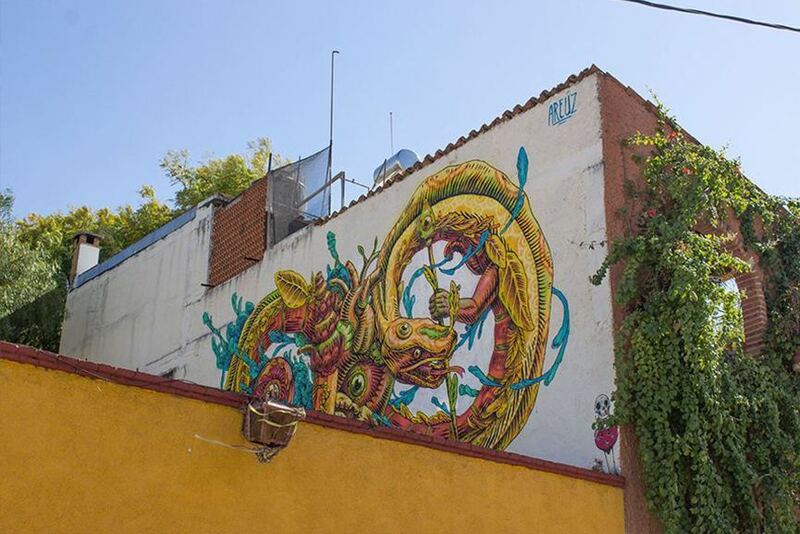 The Mexican artist places a strange, snake-like creature before us, painted on what seems to be a rather rusty old wall, covered with white paint. The vivid colors of this unusual composition cast their summer spell on us. 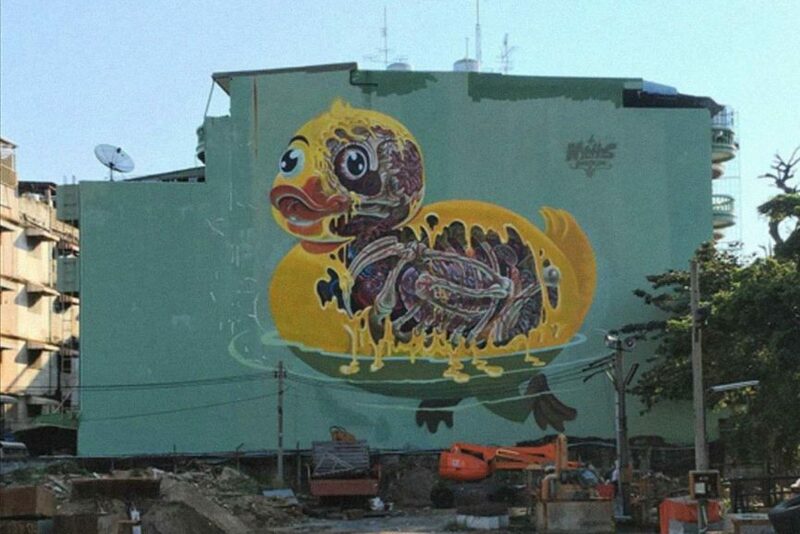 The surface of the wall of a building in Bangkok became a turquoise background for a rubber ducky. 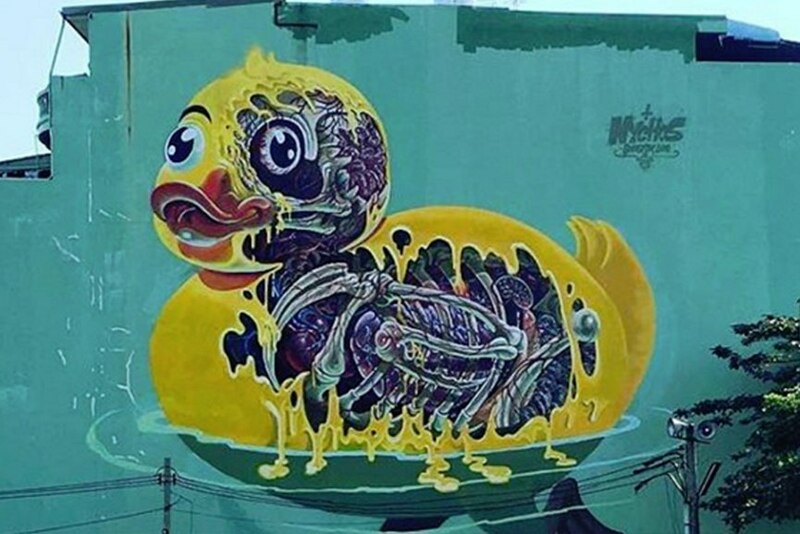 Nychos made a humorous representation of a giant bath-toy, and entitled the piece “Rubber Ducky Meltdown”. It must be hot in Bangkok, since the duckling’s lower part of the body floats in water, and the upper part still can’t avoid the melting. The sun is not kind to Nychos’s little protagonist, and therefore he even shows us the made-up anatomy of the dissolved toy. 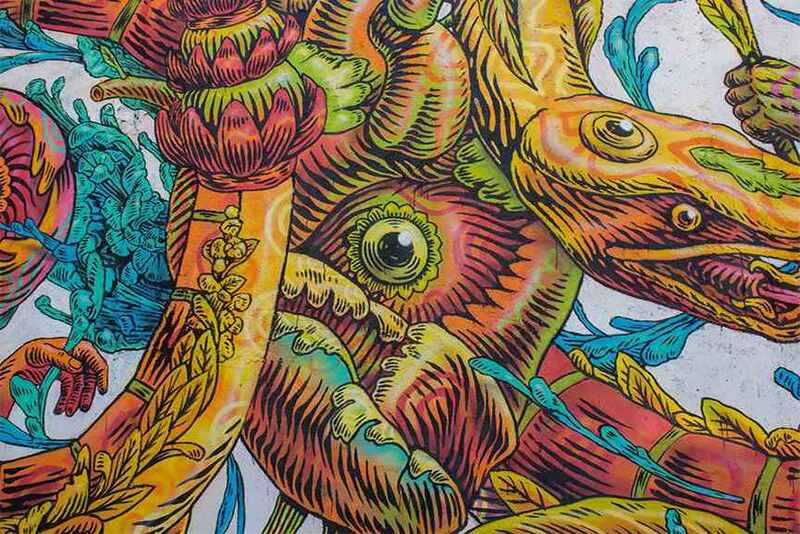 That is a subject he is already close with, since he often refers to himself as Nychos the Morbid, and describes his style this way: blending the morbid corporeality with the colorful, hyper-loony aesthetic descended from comics and cartoons . 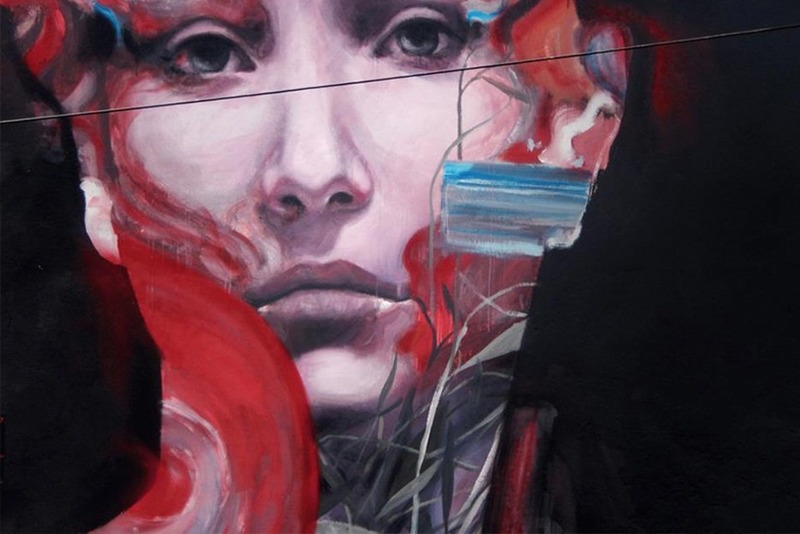 Bosoletti’s new work is entitled Melanocolia, and the girl portrayed actually represents a personification of the city. 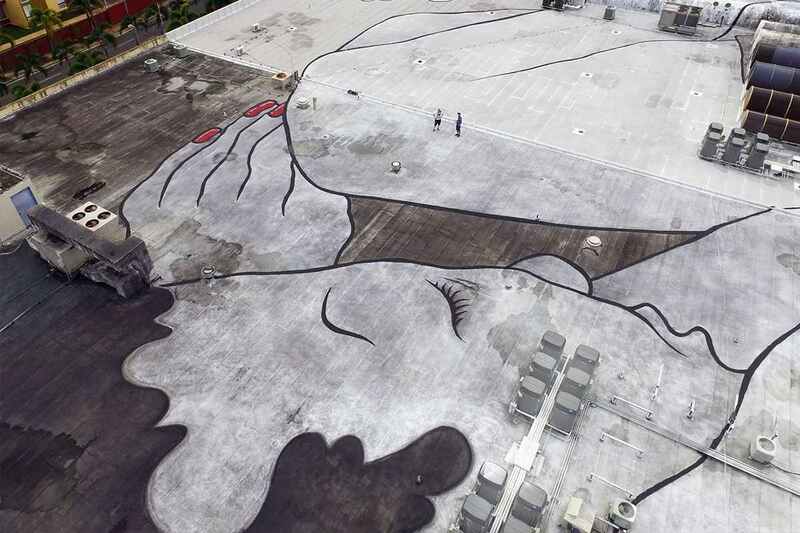 His mural is based on pure observation of his surrounding, which turns the critical eye on the financial problems the population of the city deals with. The girl’s distant, hopeless gaze seems to give us no hope, but the calmness on her face is soothing. The black background emphasizes the drama of the narrative, and provides a theatrical atmosphere, which stands in contrast with the vernacular architecture that exists on the site. 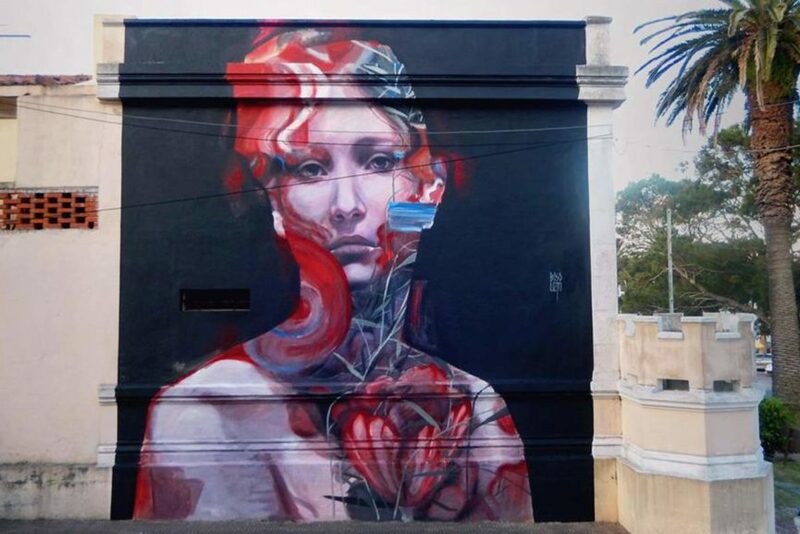 And finally, NeverCrew is a Swiss duo whose work examines the human condition, the relationship between mankind and nature, and the very nature of mankind itself. It is no wonder, then, that they choose to represent astronauts, who deal with one of the most curious human occupations and show highly inquisitive nature. This work was created for the WIP festival in New Delhi, which we talked about at the beginning of this post. The festival runs until February 15th, and there will be an exhibition after that date.